In an iOS only (for now) update to the Twitter app on Monday, users will now see their photo album first, before the traditional keyboard when composing a Tweet. 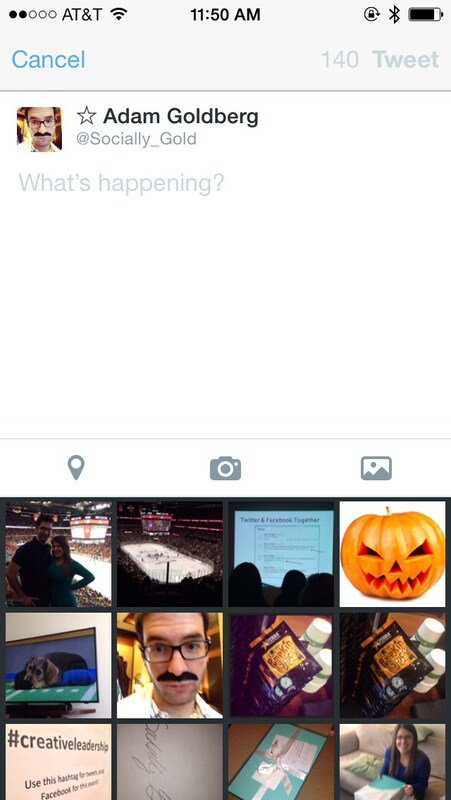 It’s a subtle change, but the update makes a big statement as to what Twitter dictates what it wants users to share. – Twitter no longer allows photos from Instagram to show on Twitter, users have to click a link. I’m not sure how I feel about this change to Twitter. What I like about the microblogging site is that I can consume who I follow really quickly. If my feed is bogged down with photos, it takes up more screen real estate. On the other hand, I can see a benefit for brands that are trying to stick out amongst the crowd. The Twitter Thumbnail preview for the desktop version is 438×193. How do you feel about the change to the Twitter iOS app? Let us know in the comments?